Magantune is an "Open Music" record company. Open Music is music that is shareable, available in "source code" form, allows derivative works and is free of cost for non-commercial use. 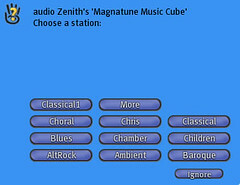 It is the concept of "open source" computer software applied to music. Magnatune are operational within SecondLife, the 3D immersive platform, and are providing their entire catalogue of music to the residents with the help of the Radio Cube we designed for them. The concept here is that a resident can pop along to Magnatune HQ, grab a radio full of radio stations which will then stream into the residents own land. 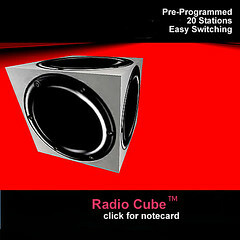 The design is very simple, yet incredibly effective in that it is a mere one prim, and when clicked presents the user with a menu of radio stations available for listening to. We were delighted to be a part of helping Magnatune, expand their presence in SecondLife.